As the drivers build up for this year’s Indianapolis 500 Pole Day, let’s check out a guy that set the fastest qualifying speed ever at Indy – only to start 20th. And that’s not the only record he holds..
Dutchman Arie Luyendyk is the holder of a handful of Indy records, official and unofficial, and all involve speed. While records are made to be beaten, the two-time Indy 500 champion owns records that are likely never to be bettered, with subsequent rule changes slowing the cars down. Luyendyk’s 1996 qualifying run has many reasons to have a place in history. Having had pole position snatched from him in the closing moments on Pole Day by Scott Brayton, that evening he had his second-place qualifying time disallowed for his car being underweight. This meant he had to run again the following day to qualify, where – with the first seven rows of cars locked in – at best he could qualify 20 places behind the pole man. “This will be the first time I’ve qualified two days running,” he semi-joked. The next day he would up his Lola-Menard like a pendulum. Every lap was a “NNNNeeeewwww LLLLaaaaapppp RRRReeecccooorrd!! !” The result was an average speed over the four laps of 236.986mph, three mph faster than the pole speed set the previous day. His final tour was 237.498mph, which also still stands as the Single Fastest Qualifying Lap. Afterwards he admitted that he could have “probably gone faster, but there was no need. The other record Luyendyk holds – and has done for 22 years – is the Fastest Winning Average Speed at 185.981mph, and that 1990 Lola-Chevrolet which is proudly displayed in the Indianapolis Motor Speedway Hall of Fame Museum. 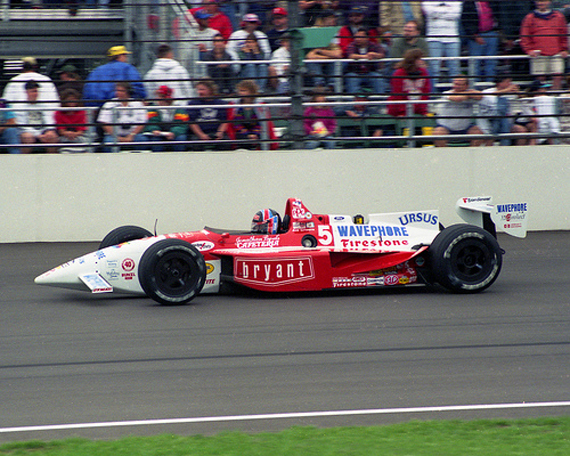 So that’s two-time Indy 500 winner (1990, 1997), three-time Indy 500 pole winner – not counting his record-breaking run in 1996 – (1993, 1997, 1999) and multiple record holder Arie Luyendyk. It’s fair to say he has the 2.5-mile Brickyard and its four corners tamed.